Reviewed on: Xbox One. Copy supplied by publisher. What’s the first thing you think of when you hear about a AAA game/TV show hybrid? If you answered “that doesn’t sound like it will work all that well,” then congratulations! Your gut instinct is pretty darn good. 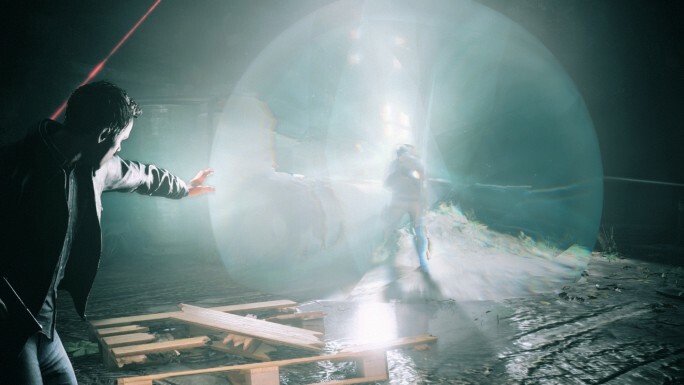 Quantum Break is an ambitious project, it picks up the worn out sci-fi trend of time travel, puts it in a game and decides to roll with it into murky territory by adding a live action series into the mix. A star studded cast lend their faces/voices to the story and relatively good production values make it seem like this could be a ground breaking entertainment hybrid. Developers Remedy show they want to see how far they can take this mix by having actions in the game impact the show, but unfortunately neither the show or the game are compelling enough to make you care very much about either. 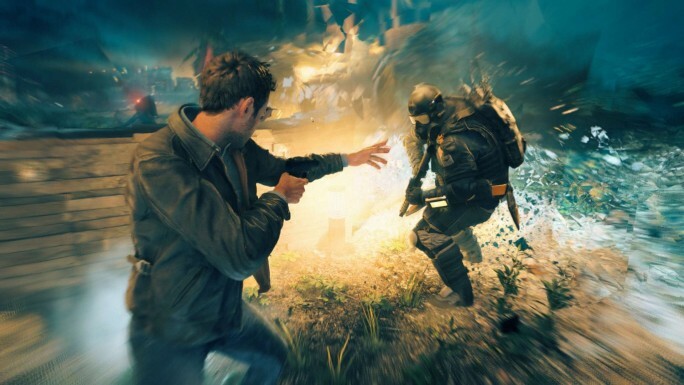 The saving grace of Quantum Break could have been the time maniplulating mechanics that protagonist Jack Joyce uses. Special time bending powers allow Jack to take out swarms of bad guys, but unfortunately this is more of a miss than a hit, leaving a rather lengthy game with tedious sections to get through to progress the thin plot. The story of Quantum Break is pretty straight forward, but through over complications, held back information, and a few questionable character motives, it becomes a bit of a mess. 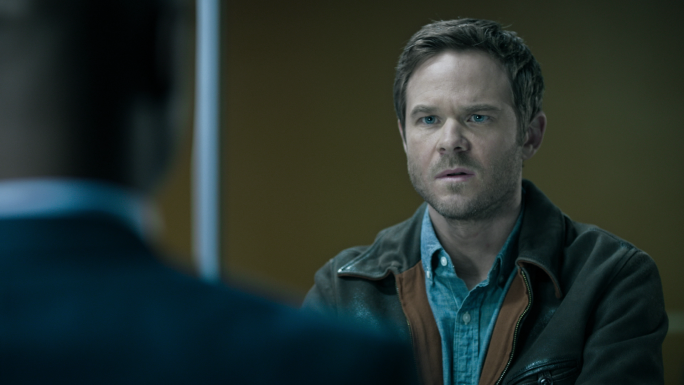 Time shenanigans begin as Jack Joyce, played by Iceman Shawn Ashmore, reunites with his old friend Paul Serene, played by Littlefinger Aiden Gillen. Paul shows Jack a time machine that he has been working on with assistance from Jack’s older brother, William Joyce, played by Meriadoc Brandybuck Dominic Monaghan. Of course the time machine goes all loopy and initiates an end of the world scenario where time will stop. This doesn’t happen immediately for… reasons, giving Jack time to save time. Also he now has super powers and is totally okay with killing hundreds of people despite not being a trained killer. His former friend Paul also has super powers, but is now evil and in charge of an evil henchman filled company, because he is extra desperate to save the world. As Jack blindly stabs in the dark looking for clues on how to save the world he is joined by a rag tag team of freedom fighters (free-time fighters?) that oppose Paul Serene’s sinister Monarch Solutions corporation. Without giving away any spoilers or twists (there are a few), the first half of the story was gripping and had enough pacing behind it to compel you to play the game, but as it dragged on things took a nose dive and I stopped caring about the stakes or the people involved. Each person you encounter is so awful and temperamental that the end of the world is welcome just to shut them up. I could deal with suspending my disbelief to have the plot work, but when both sides essentially want the same thing and keep going for each others throats, hours upon hours of letting that happen seems like enabling mentally unhinged sociopaths, not preventing the universe from being frozen. For better or worse this narrative is fleshed out by choices you make at the end of each act, known as junctions. In the junctions you take control of Paul and make choices that subtly influence the live action episode that are about to follow. The idea of a live action series with a great cast entwined throughout a sci-fi game was an amazing prospect, and initially it’s one that pays off. Each of the cast you’re introduced to seem relatively interesting, but keep in mind their actions don’t really mean anything based on the gameplay. Confused? Well it turns out the show follows a series of “bad” guys who very rarely appear in the game, and when they do, their role is more of an Easter Egg than anything meaningful. None the less there are some great performances, up until they require anything remotely physical from the cast. The action sequences play out a lot like a homage to 90s cop shows. Punches are cut between quickly so that no full effect is seen, gun shots are unconvincing and for some reason the “good guys” don’t even take cover when being shot at, they just stand there, which actually totally makes sense when you consider the gameplay (more on that later). Character motives are so bizarre that I had to replay a few parts to ensure I hadn’t missed something crucial. 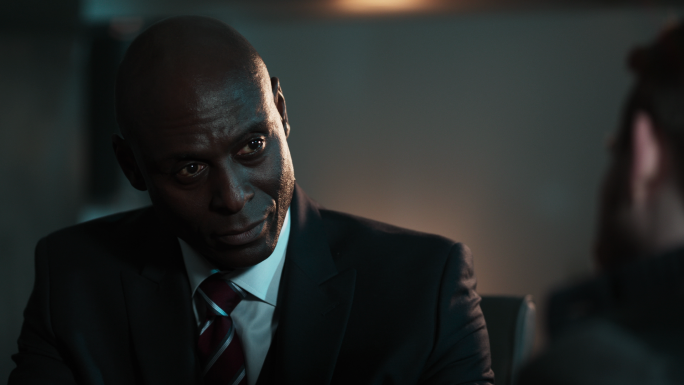 Turns out I hadn’t and Martin Hatch, played by Lieutenant Daneils Lance Reddick, makes no sense as a character, even though he is one of the the best performers in the cast. There is also one scene in particular that is so incredibly unbelievable it made me want to boo the TV and unplug my Xbox. Without spoiling too much, one of the characters chokes someone to death in front of shocked onlookers and A SECURITY GUARD, and they all look appalled and distressed, but do nothing to stop it. The strangulation takes a considerable amount of time, but nobody even moves, or says “hey, maybe don’t murder that guy,” they just stand there, And after the person is murdered the killer just walks away and nobody does anything. I get this is sci-fi, and audience expectations can be lowered a bit, but maybe rewrite that scene. The real issue with the episodes isn’t weird murder, but their length. They come in at around 25 minutes long, which is cool if you want to watch a lot of TV, but not so cool when you feel like sitting back and playing a game. This wasn’t helped by the slow streaming speeds I encountered, it took around an hour to load up an entire episode, but that could have been due to Australian internet and the state of servers prior to release. Should this be an issue at launch it can be fixed by downloading the episodes, which just so happens to take up a whopping 75gb. The blurring shows that the sci-fi is really working. The gameplay… oh the gameplay. 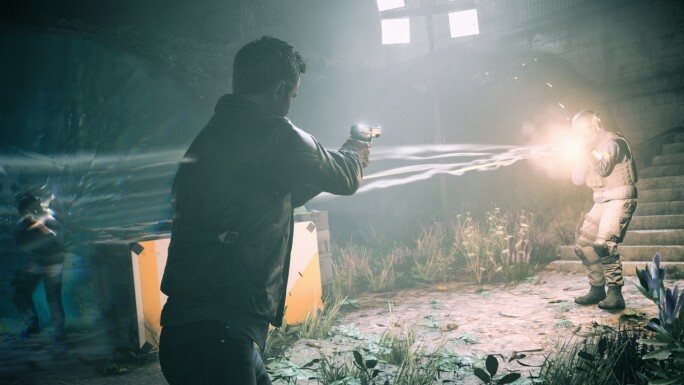 This is where I thought Quantum Break would shine, the part that the team behind Alan Wake and Max Payne would nail. How I was wrong. The real fault boils down to the fact Quantum Break is a cover based shooter… that doesn’t let you take cover. Jack Joyce awkwardly crouches behind objects, unable to use features that have been around for over a decade. He can’t sneakily blindfire over barriers, there isn’t even a button to select cover, and he can’t hip fire when moving between objects. This is stop and shoot, or slowly walk and shoot, and hope that the game lets Jack keep his head down. It’s archaic. I suppose the reasoning behind this could be so that the player and Jack have to use their time skills to take down enemies. But that simply isn’t fun. There are a few powers at your disposal. Including the ability to freeze an area around enemies and stack bullets onto them, a speed boost that ends with bullet time, the power to rewind sections of time to move objects, and a bullet shield. Each ability is pretty interesting, but not strong enough to carry the game forward. To progress you need to hit these abilities on repeat to defeat the bullet sponge enemies with the awful weapons at your disposable. Yes, the weapons are bad. Their fire response is terrible, they run out of bullets fast and they have zero personality. Each is categorised simply as Assault rifle, Handgun, Shotgun, LMG or SMG. There are variations in-between, but they are wholly uninspired and only differ based on ammo capacity and burst fire or not burst. It would have been nice to have some more types, some effective firing, and once again, the ability to actually take cover, because my god why is that not a thing? This isn’t helped at all by the fact Jack Joyce handles like a drunk frat boy. During sections that rely on jumping between platforms I died way more than necessary because the slightest touch in a direction sends him stumbling. Oh, and when you die the game will more often than not take you back a stupidly long way so you have to fight the same boring waves again and again until Jack decides self preservation might help him with his objectives. Aside from the unexciting gameplay and controls, I experienced a few technical issues with Quantum Break. 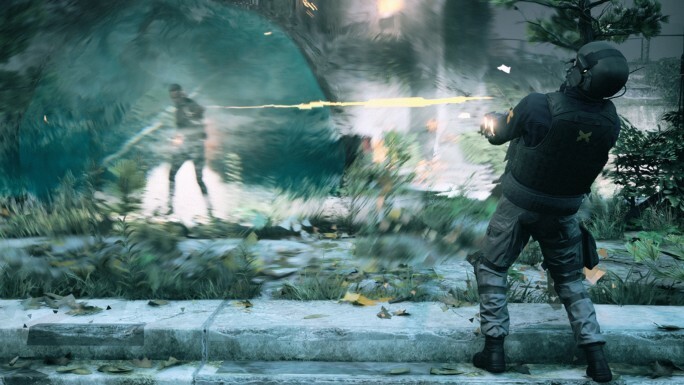 The most prominent of which was motion blur, this is something that Remedy should have fixed in time for launch on April 5, but I think it’s worth writing about because it’s still an issue only five days prior to release. I’m not too sure what Remedy were trying to make players feel when playing Quantum Break, but I’m pretty sure it wasn’t anger. There’s no other way to describe my lasting impressions of this game. I felt frustrated, disappointed, but most of all angry. This doesn’t come from a place of hate, but one of optimism. I had high hopes for Quantum Break. It had the cast to back it up, a proven developer, but sadly it missed the mark in almost every feat it tried to accomplish. Pros: Good cast. Some nice Alan Wake Easter Eggs that remind you of better times. Ambitious storytelling. Cons: Plot is all over the place. Gameplay and controls simply aren’t good. Episodes of the show are too long. 4/10 – An innovative game that unfortunately misses the mark. 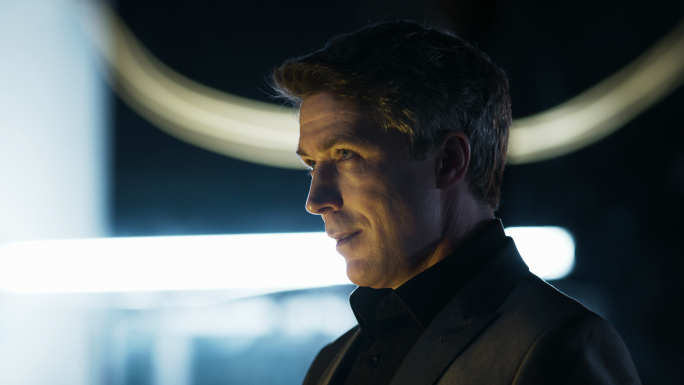 Quantum Break is set for an April 5 release on Xbox One and Windows 10. Save the universe with Charlie on Twitter @clbraith, and don’t forget to follow @load_screen and like us on Facebook.